Trump this year has imposed steep tariffs on $250 billion of Chinese goods and has threatened to hit the remaining $267 billion in products the US imports from the world's number two economy each year. President Donald Trump said Friday that China was ready to make a deal to defuse trade tensions, so he might not have to punish the country with more import tariffs. A deal to resolve the dispute would be a huge breakthrough on the issue that has dominated much of Trump's two years in office, blowback from which threatens to take the steam out of the US economy. "China wants to make a deal," Trump told reporters. "They sent a list of things that they are willing to do." While the offer is not acceptable yet, he said he was optimistic for an agreement to get "reciprocal" trade. US companies and farmers have complained of lost business and rising prices for key components as a result of the trade friction and that was a factor in some of the contests in the midterm congressional elections early this month. "I think a deal will be made and we will find out very soon," Trump said, noting Beijing's list included 142 items and includes "a lot of the things we asked for." "Some things were left off. We will probably get them, too," he said. But the statements seemed to contradict comments from Trump's Commerce Secretary Wilbur Ross, who just hours earlier had said a deal with Beijing before January was "impossible." 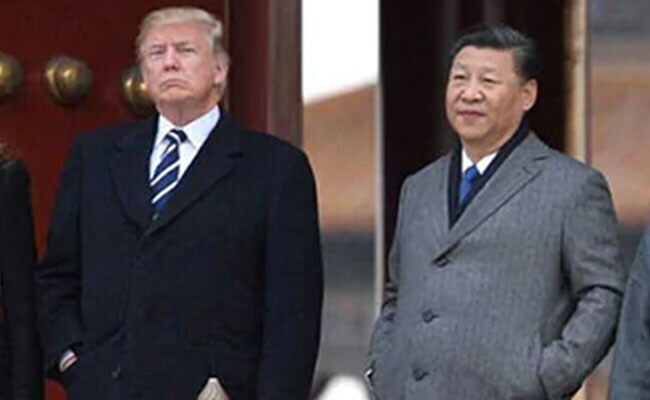 Trump is due to meet with China's President Xi Jinping late this month in Buenos Aires on the sidelines of the Group of 20 leaders summit. However, Ross said those talks would serve as a framework to resolving the dispute. "We certainly won't have a full formal deal by January. Impossible," he said, according to Bloomberg. The January date is key since the 10 percent tariffs in place on $200 billion in annual imports from China is due to increase to 25 percent. Trump indicated he will continue to continue to take a hard line with China until the country changes. US officials have highlighted high Chinese tariffs but also the country's trade and investment rules that allows rampant theft of American technology. "We have to have reciprocal trade," he said. "We can't have trade meant for stupid people. That's the way they took advantage of our country." US stocks jumped following Trump's remarks, but quickly retreated although the benchmark Dow Jones Industrial Average ended the day with a slight increase. Investors are hoping for a deal soon to end the uncertainty which hurts the bottom line for many companies as well as increasing prices for consumers. Some firms have even warned that they might have to postpone investment plans if they cannot insure a steady supply of material. Economists say the tariffs' full bite has yet to hit the American economy but the trade conflict comes at a bad time for China, which is seeing slower growth. In addition, Chad Bown of the Peterson Institute for International Economics, who has been studying the impact of the trade tariffs closely, said in a report on Thursday that Trump's tariffs on steel, which largely targeted China and other big producers, were inflicting collateral damage on poorer nations that are small producers and pose no threat to the US economy.